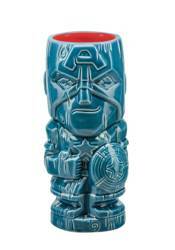 Marvel's greatest heroes and villains are going Tiki! These Geeki Tiki stand approximately 7' tall and are made of durable ceramic that is top-shelf dishwasher safe and microwaveable. These glasses hold up to 15 ounces of your favorite beverage. Collect all your favorite Marvel characters, including Captain America, Doctor Strange, Loki, Spider-Gwen, and Thor. FLASH POP! HEROES VINYL FIGURE FUTURE FIGHT SHARON ROGERS AS CAPTAIN AMERICA POP!